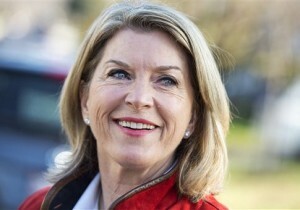 Kathleen Matthews, the wife of MSNBC host Chris Matthews and former chief communications officer at Marriott international, lost the Democratic primary in Maryland’s 8th congressional district despite help from her husband and donors and associates of Hillary Clinton. Maryland State Senator Jamie Raskin finished in front with 34 percent of the vote, followed by David Trone, owner of Total Wine & More, with 27 percent. Matthews clocked in at a distant third with 24 percent. The race to fill the open congressional seat vacated by Rep. Chris Van Hollen, who is running for U.S Senate in the Maryland, turned out to be the most expensive race in the nation, as $14 million total was spent by the candidates. Jamie Raskin, a constitutional law professor at American University and three-term Democratic state senator in Maryland, pulled in $1.8 million in individual contributions throughout his campaign. David Trone announced he was entering the Democratic race in late January—just three months before the primary took place. Trone’s campaign was largely self-funded, as he poured a record-breaking $12 million of his own money into the effort. He did not accept any individual contributions over $10 and received $5,620 from such donations. Trone did not accept any contributions from political action committees, lobbyists, or corporations—a point he made a cornerstone of his campaign. Matthews hauled in $1.8 million in individual contributions throughout the primary. Individuals at Marriott International, her former employer, poured $58,750 into her campaign, according to data compiled by the Center for Responsive Politics. Matthews also received $22,300 from those who work at the Blackstone Group, an investment banking firm. Matthews also received help from some of Hillary Clinton’s top donors and associates in her failed quest to win the Democratic nomination. The donors, many of whom are close friends and among the biggest backers of Clinton, aided Matthews by giving the maximum amount allowed by law. Elaine Schuster, a delegate to the United Nations General Assembly who previously served on the board of the Clinton Foundation, gave $2,700 to Matthews’ campaign. Elaine, along with her husband Gerald, are one of only 12 families who have provided financial help to every Clinton campaign and cause. Their granddaughter, who works as a digital strategist on Clinton’s presidential campaign, also gave to the campaign of Matthews last November. Mark Penn, a close friend of the Clintons who worked as President Bill Clinton’s pollster and was also a former senior campaign strategist for Hillary, gave the maximum $2,700 allowed to Matthews. Alan Fleischmann, the founder and president of Laurel Strategies, a business advisory firm, earmarked a $2,700 contribution to Matthews’ campaign through ActBlue, an "online clearinghouse for Democratic" action that that pushes contributions to candidates and committees specified by donors. Fleischmann is a founding member of the Clinton Global Initiative. Another longtime Clinton friend and associate who gave to Matthews is Heather Podesta, the founder of the D.C.-based lobbying firm Heather Podesta and Partners. She donated $2,700 to the Matthews campaign through ActBlue. Podesta has bundled over $375,000 for Hillary’s presidential campaign. Chris Matthews came under fire as calls for him to suspend his show intensified throughout his wife’s campaign. Guests who appeared on his show donated a combined $80,000 to Kathleen’s campaign. Supporters of Sen. Bernie Sanders also called the donations from Clinton associates a conflict of interest and worried that the Hardball host would not be able to cover the Democratic presidential primary in a way that did not favor Hillary Clinton.